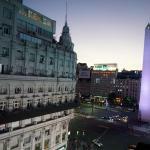 2nd Argentine Congress of Pediatric Internal Medicine is organized by Argentine Society of Pediatrics / Sociedad Argentina de Pediatria (SAP) and will be held from May 20 - 22, 2019 at Exe Hotel Colon, Buenos Aires, Argentina. • To achieve the participation of all health professionals interested in acquiring updated scientific information about the concepts and advances related to Pediatric Internal Medicine. • Create a space in which we can exchange ideas and knowledge as well as expose experiences and opinions interacting with prestigious colleagues, both inside and outside the country.